A while back I found this recipe for the world's easiest ice cream, which I still haven't tried, but I'm going to. I shared the link on Facebook, and one of my friends said she wanted one of those Ninjas. Ninjas? What? So I went back to the recipe and checked out the Ninja, read the reviews, and decided I wanted one, too. I've been toying with buying a Vita-Mix for the last several years at the State Fair, but I'm just too cheap to get one. Some of the people who reviewed this said they liked the Ninja better than the Vita-Mix, and my brother who has a Vita-Mix said they mostly use it for smoothies and ice cream - and they do use it several times a month, but not as often as they could. So, when I weighed the cost and the potential use, I figured $40 (w/ shipping) for the Ninja (with an extra pitcher and extra 2-cup bowl, found new on ebay) was a lot better than $450 for the Vita-Mix. My Ninja came in the mail yesterday, and I just had to try it today. First Cory and I crushed ice and made some iced coffee - yum! And then I made some salsa! Add all ingredients to the bowl. Use short pulses, about 3 times or until desired consistency is reached. Serve with tortilla chips. Makes about 2-1/2 cups. I pretty much followed the recipe in the book that came with my Ninja - except I used two hot peppers (because Cory wanted them) instead of 1, I didn't use the 1/2 tsp. sugar, and I didn't have a lime so I used lemon juice - cut a small half and didn't squeeze all of the juice out. Also, the recipe called for cilantro, which would have been so good in this, but I didn't have any. Even without it, this salsa was amazing - and so easy! We had this for dinner tonight. Since I have zucchini from the garden and tomatoes from the garden, it's only right to use them. This has a really nice flavor. Brown meat with onions, salt and garlic salt; drain. Stir in green pepper, oregano, parsley, bread crumbs, Parmesan cheese, and egg until well mixed; set aside. Spread 2 cups zucchini in pie pan or casserole dish; cover with meat mixture. Top with tomato slices and rest of zucchini. Cover with pie crust, cutting steam vents. Put into preheated 350° oven and bake 1 hour or until crust is lightly browned. The original recipe called for a double pastry crust, but there seems to be too much liquid in the filling so that the bottom crust turns out soggy. It is better with just the top crust. I've got lots of zucchini and peppers from the garden, and I bought some eggplant from the Farmers' Market this week so I could make this. And it is so good. In 6-quart Dutch oven or saucepot over medium heat, cook onion and garlic in hot olive oil until tender, about 10 minutes, stirring occasionally. Add eggplant and the green pepper; cook for 5 minutes, stirring frequently. Stir in zucchini, water, salt, oregano and sugar; heat to boiling. Reduce heat to medium-low and cook 10 minutes. Stir in tomatoes and cook for an additional 20 minutes or until vegetables are tender, stirring occasionally. Serve hot or follow step 5. Cover vegetable mixture and refrigerate to serve cold later. The original recipe actually said to cut the garlic clove in half and then discard it prior to adding the eggplant and green pepper. Not a chance. I just minced it and left it in. Also, I used one large zucchini and substituted the can of diced tomatoes for the 2 fresh tomatoes (cut in wedges and added at the very end) called for in the original recipe. My tomatoes are just now starting to ripen, so I didn't have any to use yet. I let this cool down to refrigerate for tomorrow. I'm trying to decide whether I should heat it back up or serve it cold. I couldn't help myself and ate some when it was lukewarm, and that seemed like the perfect temperature. What do you think - hot or cold? I've got a lot of basil growing in the garden and was looking for a way to use it. 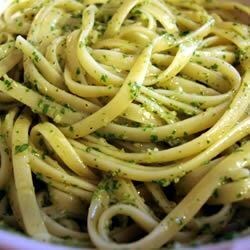 I found this recipe for Easy Pesto on allrecipes.com and changed it a little after reading some of the comments. Preheat oven to 450°. Place almonds on a pie plate, and bake for 10 minutes, or until lightly toasted. To serve, cook 1/2 box (8 oz.) fettuccine as directed on the package. Reserving 3/4 cup of the pasta water, drain the fettuccine and then toss it with 1/4 cup of the reserved pasta water, the pesto and a diced tomato or two. If the sauce seems too thick, add more of the reserved pasta water. Serve with additional Parmesan and grilled chicken, if desired.